Hayley is a creative brain using science to seek practical solutions to issues facing our ocean. She is also a fisherman, surfer, musician, and lover of the marine environment. Hayley got her feet wet in marine science while obtaining a B.S. in Biological Science at UC Davis, Bodega Marine Lab where she developed an admiration for all that came with the rise and fall of the tides. She received a M.S. in Marine Biology at San Francisco State University, Romberg Tiburon Center in 2012 (Stillman lab), where she studied how ocean acidification and other stressors impact development in intertidal crabs. 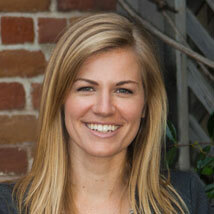 Hayley began at Ocean Science Trust as a 2013 California Sea Grant fellow hoping to make science matter. Hayley works across a range of projects, with a focus on supporting action on ocean acidification. Hayley also leads Ocean Science Trust’s peer review program and oversees the work of the Ocean Protection Council Science Advisory Team. Hayley enjoys the strong connection to the academic community and the opportunity to take science in a new direction. Ocean Science Trust allows her to wear many hats, envision what’s possible, and come up with novel ways to bring the possible to life.